And with that, another season of Insecure comes to an end. “Ghost-Like” is an amazing finale. Sadly, it comes at the end of an oddly paced season that leaves things feeling rushed. As the show celebrates Issa’s 30th birthday, there’s some beautiful symmetry at play. Issa has come a long way since her 29th birthday in the show’s pilot (yes, only a year has passed on the show). This season ends with her, happy, on her own couch, figuring out what she really wants. This is an upgrade from Issa sitting on her abandoned Lawrence-couch with Molly in season one. It’s definitely an upgrade from sleeping on Daniel’s couch at the beginning of this season. Overall, this episode shows us the growth we’ve wanted to see from these characters. Molly has finally learned to question the negative instincts that have led her to cut great people out of her life. Issa has learned to focus on her goals and desires. Old Issa definitely would’ve let Nathan back into her arms with his big watery eyes, but season three Issa knows better. Old Molly would’ve had a hard time reaching out to her coworkers or apologizing to Andrew. As Kelli would say, that’s growth. Since Insecure’s seasons are so short, you have to look at the show’s overall narrative from season to season to truly appreciate how far these characters have come. Because if you just take season three by itself, well, the factors behind that growth haven’t always been clear. Looking back, Lawrence’s absence feels like a real miss for the show. Yes, Issa had to have one final go with Daniel before she could move on, but did we really need to spend so much time with Daniel to have that happen? They made us listen to that sad basement beat way too many times for how little impact Daniel had at the end of the day. I would’ve taken an actual scene where Tiffany and Kelli forgive each other rather than any of the time we spent with Daniel and his family. Unlike previous seasons, the show’s 8-episode structure felt more pronounced. Just like “High-Like,” “Ghost-Like” is an incredibly well-written and directed episode that feels like it should’ve taken place earlier. Molly had the best structured plot this season, even though her relationship with Dro was written off pretty quickly. We know that Molly felt led on by Dro, but we don’t exactly know why. What led her to make the boundaries she created when she came back from Morocco? What were her real feelings for Dro? What happened to her Chicago boyfriend? In the end, these questions don’t really matter because what it comes down to is Molly protecting herself before she thinks these men will hurt her. Maybe Dro didn’t actually do anything prior to her creating boundaries, but Molly suspected the worst. The Jared moment was so frustrating and fulfilling because it immediately punished Molly for jumping to her worst assumptions and habits. Each characters’ growth is summarized in this season’s Molly/Issa sleepover. In season two, this gave us the beautiful “Morocco” moment. This season, it’s far more confrontational. Of course Molly did the right thing when she stopped Nathan, but it was wrong for her not to tell Issa about it. Issa is in a place where she’s finally ready to make her own decisions about her life. She’s done letting things happen to her and is ready to be proactive. She’s taking charge of her block party. She’s taking care of her home. While Nathan remains a bit of a cliffhanger for next season, much like Issa, I’m not stressing about his place in her life right now. Will she get the new job she interviewed for? Will she be happy that Lawrence has really moved on? Hopefully next season focuses on that rather than spending 3 episodes on Nathan’s budding career as a barber. This moment is also when Molly realizes she’ll be alone if she continues down her current path. Molly doesn’t always take Issa’s advice, but this time I’m glad she did. It may be too late to turn things around in her office, but it may not be too late for Andrew. Which is great because, wow, that guy is beautiful. Did he have a fan blowing his hair while he was playing video games or did I imagine that? Either way, he’s a great fit for Molly and he isn’t afraid to push her boundaries. This was also another wonderful episode for Lawrence, who somehow managed to have a great arc even though he was only in half the season. Lawrence’s dad finally makes him realize that love doesn’t come easy. “Easy” is what led to his and Issa’s complacency. “Easy” is what leads to banging waitresses and STDs. Real love takes work. It’s good that Lawrence and Issa running into each other was just a bait-and-switch, he’s really done and ready to put the work in with someone else. It just so happens that someone else seems to be a real adult who’s actually willing to put the work in too. Of course, it’s a bummer that Issa’s new friend is dating Lawrence, but it’ll be the true test of Issa’s growth. Will she sacrifice her event over petty relationship drama? Hopefully not, but that’ll probably depend on her feelings for Nathan. Ohhhhhh, Nathan. Nathan, Nathan, Nathan. Maybe Nathan is dealing with personal issues. Maybe it’s family issues. Maybe it’s mental health issues. Maybe he’s just lying to her. Either way, his inability to communicate does not point to the type of maturity Issa needs in a relationship. His speech was incredibly realistic and probably triggered anyone who’s dated a guy between the ages of 22-29 (and older, honestly). Still, it was vague and didn’t entirely negate him of blame in the situation or give Issa a reason. He hurt Issa and she calmly explained why that was unfair. Until he can communicate on her level...well, work is probably a better use of her time. “Ghost-Like” has the pieces of an amazing finale, it just comes at the end of a season that felt particularly impacted by the show’s tight timing. Imagine what this show could do with a 12-episode season. Hell, even 10. Moments like Lawrence maybe dating a church girl and Daniel’s insecurities around his career are great, but they feel like time wasted when they don’t particularly go anywhere. 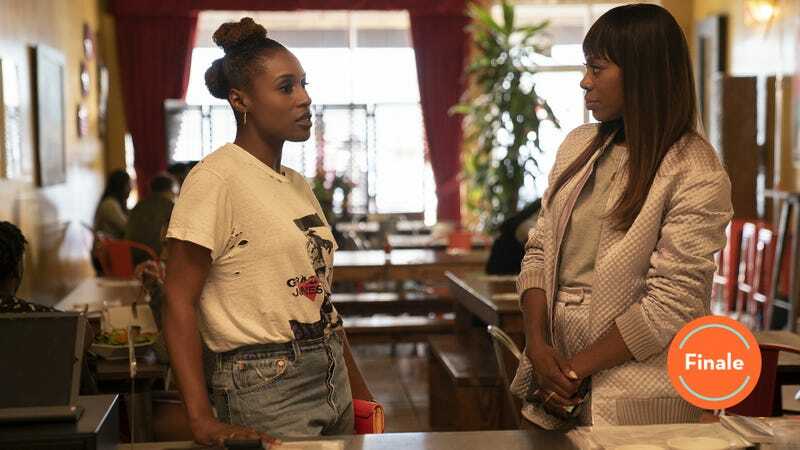 This season solidified Insecure as one of the best written shows on television and confirmed that eight episodes is no longer enough time to contain its narrative. I really thought we’d at least get Daniel reaching out to say Happy Birthday and Issa blowing it off. I knew Jared was going to have a girlfriend and it felt so good to see Molly’s biphobia called out. Molly was awful to Jared. It’s weird that the show’s writers were able to dictate every guy who’s ghosted me for Nathan’s speech. That was just wild. Great work. Shout out to Regina King for her wonderful direction this episode. Ok, the graveyard/Ghosts of Exes Past thing was a little too heavy-handed. We get it–old lovers, ghosts, cemetery. CHAD GOT HIS WIFE BACK!!! I hope we get to meet her. I wonder when we’ll meet Issa’s parents. I need 1,000 more words to talk about The Last Dragon.